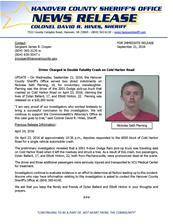 UPDATE – On Wednesday, September 21, 2016, the Hanover County Sheriff’s Office served two direct indictments on Nickolas Seth Fleming, 18, for involuntary manslaughter. Fleming was the driver of the 2001 Dodge pick-up truck that crashed on Cold Harbor Road on April 23, 2016, claiming the lives of Dylan Ballard, 17, and Elliott Hinton, 22. Fleming was released on a $20,000 bond. “I am very proud of our investigators who worked tirelessly to bring a successful conclusion to this investigation. We will continue to support the Commonwealth’s Attorney’s Office as this case goes to trial,” said Colonel David R. Hines, Sheriff. Hanover Va. – On April 23, 2016 at approximately 10:36 p.m., deputies responded to the 6000 block of Cold Harbor Road for a single vehicle automobile crash. The preliminary investigation revealed that a 2001 4-door Dodge Ram pick-up truck was traveling east on Cold Harbor Road when it left the roadway and struck a tree. As a result of this crash, two passengers, Dylan Ballard, 17, and Elliott Hinton, 22, both from Mechanicsville, were pronounced dead at the scene. The driver and three additional passengers were seriously injured and transported to VCU Medical Center for treatment. Investigators continue to evaluate evidence in an effort to determine all factors leading up to this incident. Anyone who may have information relating to this investigation is asked to contact the Hanover County Sheriff’s Office at (804) 365-6140. We ask that you keep the family and friends of Dylan Ballard and Elliott Hinton in your thoughts and prayers.